I’ve been working on a new project lately, and it’s just about out of the prototype stage and into production. Since I was a kid I always liked little books, especially guide books, schedules and information booklets. 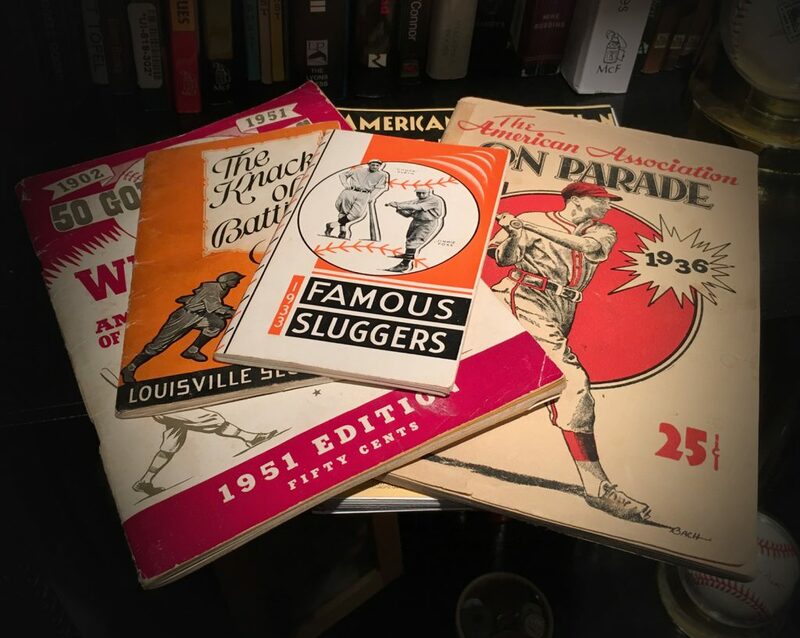 Being a baseball fan, I naturally gravitated towards the sports ones, and would scour my grandparent’s attic in search of these little treasures. Every season baseball teams would put out there schedule and roster in small pocket-sized format and leagues would produce their own “who’s who” with a small biography of each player. These little books didn’t take up much room and were easy to keep at arm’s length for quick reference. In the decades before the internet, these guides and booklets were the favored form of easy information reference. 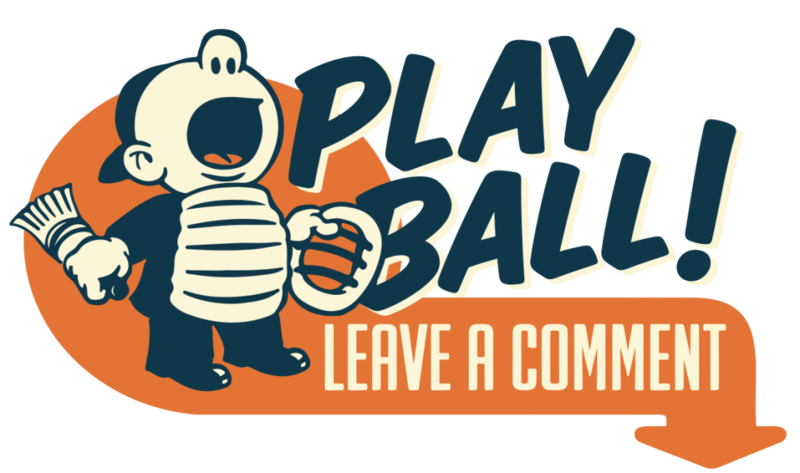 Recently, I was looking for a new way to share my baseball stories and drawings. 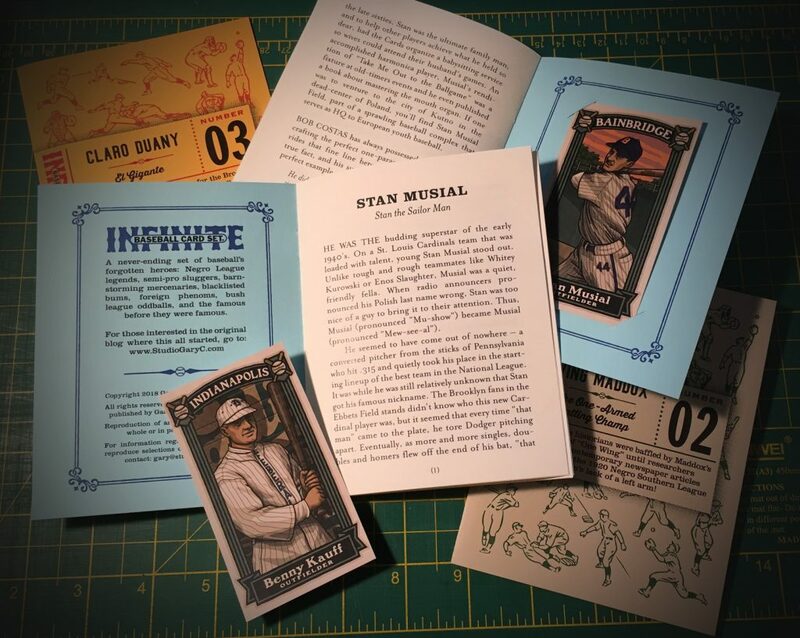 So far I published a book, The League of Outsider Baseball, and sporadically put out a journal, 21: The Illustrated Journal of Outsider Baseball. However, I wanted to come up with a more immediate format with which I could produce my work. The stack of old baseball schedules sitting on my bookshelf provided me with the perfect solution. 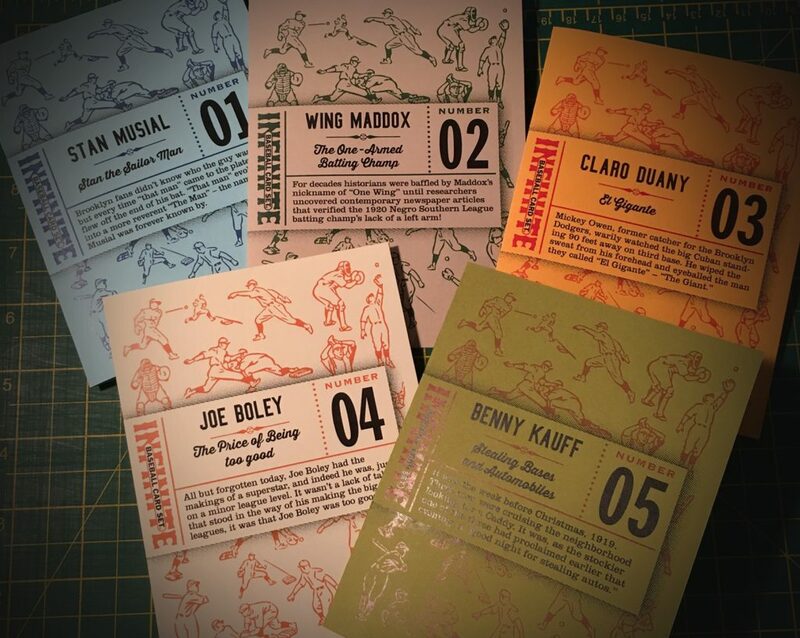 Each of the numbered 4 1/4 x 5 1/2″ booklets feature an 8 to 24 page story along with a colored art card attached to the inside back cover. These mini-books can be bought individually, thematically or collected as a never-ending set. In addition to the individual booklets, I envision there being themed sets, such as the series I did on Minor League Home Run Champs. Because these will be handmade in my studio, the production number of each booklet will be low, available on first-come – first serve basis. I’m pretty excited about this new way to get my work out there. So far, the set of 5 I produced look really cool together as a set as well as on their own. Stay tuned in the next week or so to find out when and how they will become available for purchase in my online store.